One Jasmine Chai and Tea company is a sister company of the Blue Dog Kitchen in Ballard, Seattle, WA. We started making our own chai in 2004 at our first shop, the Blue Dog Coffeehouse in the University District in Seattle. After years of living and travel throughout Asia, an Owner, Anna started drinking tea and chai at a very young age. She was determined to make the best chai possible for our store to serve customers. And we proudly to say we do! With many followers and chai enthusiasts praise about our chai is the best they’d ever had; we did something right. 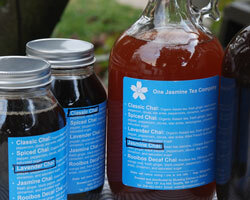 We started wholesaling our chai concentrate in 2008 under the name of One Jasmine chai. We are an artisan chai maker and like to keep it that way. We make our chai using all natural ingredients and in small batches to guarantee the quality.